Senior Vice President, Penske Corp.
Chairman, Chevrolet Detroit Belle Isle Grand Prix. Chevrolet Detroit Belle Isle Grand Prix"
Denker will give an overview of Penske Corporation and its commitment to Detroit through various initiatives, including the Chevrolet Detroit Belle Isle Grand Prix, to be held in less than 30 days. Tickets, including hospitality passes, are valued at $2,000 and are provided compliments of SKF Automotive. Bud Denker is Executive Vice President of Penske Automotive Group and Penske Racing. 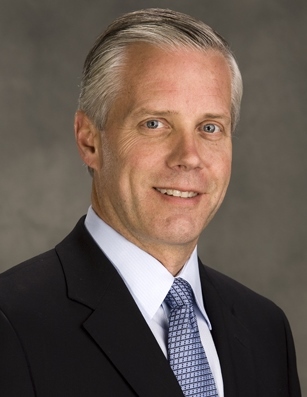 He serves as Senior Vice President of Penske Corporation and as President of Penske Car Rental which includes Hertz operations in Memphis, Tennessee and throughout Indiana. Denker is responsible for Penske Corporation's marketing and communications function which includes Penske Automotive Group's 323 globally located automotive dealerships. Denker manages Penske Racing's marketing and commercial functions for its IndyCar and NASCAR disciplines whose teams will compete in over 90 races in 2014. Finally, he serves as Chairman of the Chevrolet Detroit Belle Isle Grand Prix, which brought world-class racing back to Detroit in 2007 and will return again this year, May 30 - June 1. He resides in Bloomfield Hills, Michigan with his wife Melissa and two sons, Christian and Cameron. MSED Event Cancellation Policy: Cancellations will be accepted until 5pm on Friday, May 16th. Cancellations received by this date will be refunded less a 10% administrative fee, with a minimum charge of $5. Refunds cannot be issued for cancellations received after this date; however, substitutions for another person to attend in your place are gladly accepted.